By now I think most people will know I am a big fan of simple concept games, So when James told me to check out Rocky Hong's BulletWaltz late one Tuesday evening I immediately added it to my console via Ouya's handy 'send to console' feature on their web site. I got myself a few hours shut eye and fired it up first thing the next day. ...I really am glad I got some sleep first. 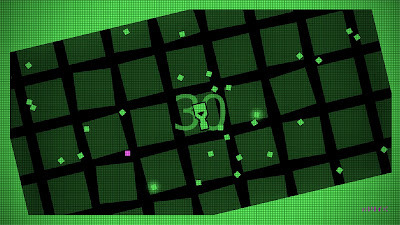 Bullet Waltz is a dodge'em up comprised of simply moving your dot away from other dots, although that's kind of like saying Super Hexagon is simply a game with a few hexagons in it. 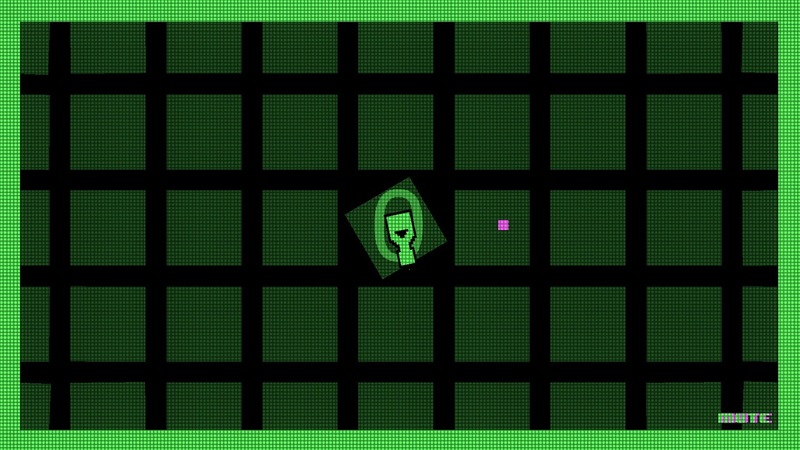 You have a turret aimlessly shooting endlessly bouncing bullets into the play area at a leisurely pace, initially you'll frown a little because it's boring, before too long however you'll realise that these lethargic squares of death are starting to fill the entire play area. 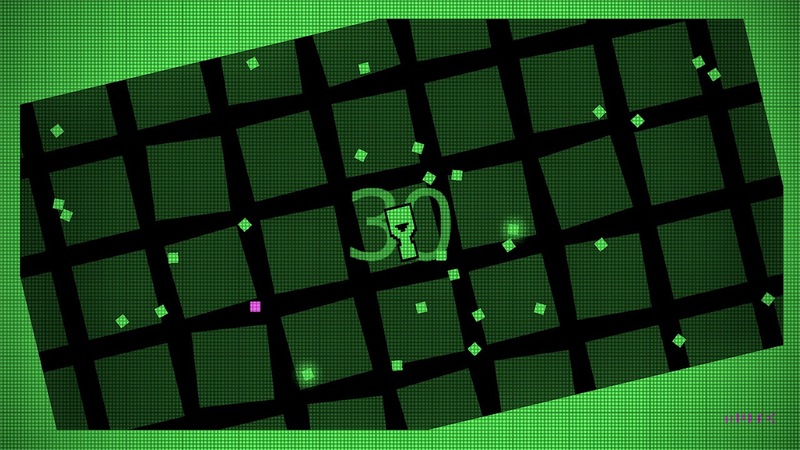 Then the screen starts rotating and the bullets speed becomes rhythmic. Then you die. Thankfully, the central cannon will occasionally fire a glowing power-up bullet that you can collect, giving you indestructibility and a welcome opportunity to clear some of those bouncing death-squares from the arena. Oh, and with a lack of any HUD the way the power-up timer is integrated into the background is particularly innovative - so thumbs up for that! Gameplay is the main meal here and it's a tasty one at that. Like all decent simple concept games, you are in charge of your personal effort investment and should you be a high-score junkie like me, you are heading down a long, retina scarring path. Controls are tight and responsive, just make sure your Ouya pad is stocked with new batteries because input lag can seriously ruin your game. (Or simply use a wired XBox 360 controller - JM). Graphics are stylish and the various special effects are interesting - if borderline distracting. One particular rhythmic 'pulse' that accompanies the music/gameplay made me involuntarily blink every time it happened, and as much as I enjoyed the game it is certainly not one that I could play for a long sitting. To the credit of the team, there is a huge 'flash' warning as the game starts. Audio and music is slick and harks back to the golden age of personal computers such as the venerable C64 and its older sibling the Amiga. It's a steady stream of silky bleeps and bloops with heavy bass tones and sharp high ends - a real treat. 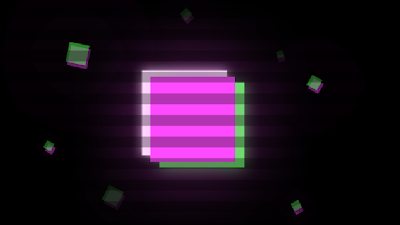 In summary if your fan of Super Hexagon and its ilk - give it a shot, after all its free. That Ouya is only going to gather dust if you don't use it and these games are the reason we own those little indie Rubick's cubes. Download the Ouya version here (from the Discover store). End of Line for Unlimited Edition?